Had enough left over yarn for a half-length Boteh. Added two button loop closures to make a neck warmer. Very happy with the result 🙂 This one will be “gifted”. 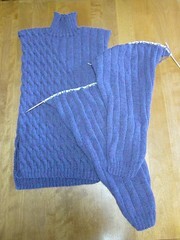 Smocked Scarf, Kaleidoscope Cardi and Diagonal Progression are all coming along. I still work best to the “Circuit Knitting” technique. Now, if that only burned as many calories as “Circuit Training”! 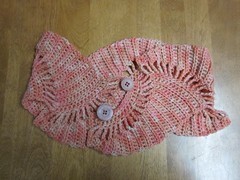 This entry was posted in Crochet, Knitting, Scaves and Cowls and tagged Scarves, WIP's 2010. Bookmark the permalink.